Many teenage diaries have been filled with rock and roll dreams, but when a guitar instructor introduced Dave Schafer to Nick Panos, thinking their styles would complement each other, they decided to turn those teenage dreams into reality. They jammed together for a couple of years, writing songs and hooking up with a string of vocalists, drummers, and bass players, but nothing really stuck. With not much happening for him in the Chicago scene, Dave seized an opportunity to relocate to the City of Angels and hook up with a band that was supposedly building a tidal wave of buzz; unfortunately, the tidal wave turned out to be more like a ripple, and as the ripple faded to nothing, so did the band. With his Los Angeles experiment behind him, Dave returned to Chicago where he and Nick decided to take another shot at the rock and roll dream that had thus far eluded them. Their first recruit was bassist Mike Levin. There was never even a scintilla of hesitation; as soon as Nick and Dave heard him play, they knew he was just the man for the job, a perfect fit for the position. Mike and Dave became the comedic duo of the group, partners in crime when it came to pranks and lightening up the long hours in the recording studio. With the strings all manned, the band turned their attention to finding someone to bang out the beats. A friend steered them in the direction of drummer Vince Consolo and a meeting ensued at Vince’s rehearsal studio. Before they even heard him play, the band knew they wanted Vince in the mix. He had the right look, a great attitude, and everyone got along immediately. The fact that he could play the hell out of a drum set was just the icing on the proverbial cake. While the hunt for a bassist and drummer had gone relatively quickly, the same could not be said for the search for a singer. The band took out full-page advertisements in an attempt to appear as if they had money behind them and hopefully lure in a higher caliber of talent. Instead, what they got were a couple of decent vocalists followed by a long string of piss-poor posers, klutzy clowns, and woeful wannabes. Then Jeff Evans took a shot at the gig, and while the band instantly liked him, they were unsure if he was the right fit, as he was not your typical hard rock front man. He was well-educated, listened to Marillon, and quoted Charles Butowski. His vocal style was unique, quite different from the stereotypical hair-metal screamer, loaded with depth and a cool phrasing method that possessed a uniquely hypnotic power. It took several auditions before the band was comfortable offering him the position, but they slowly realized that Jeff’s singing style was in lockstep with the direction they wanted to pursue. Having been strung along for a while, Jeff almost told them to take the job and shove it, but sensing something special was happening, he decided to come along for the ride. Nearly a year after Nick and Dave decided to put together a band, DEAR DIARY’s lineup was complete. At times they struggled to mold the members’ varying influences into one cohesive sound, but when everything clicked into place, hard rock magic happened, resulting in songs both different from the mainstream while simultaneously laden with mass appeal. The band constructed their songs the same way an architect designs a building, each layer designed to stand on its own while also serving to support the other aspects. Even the backing vocals were given careful consideration, the gang/shout/chant approach eschewed in favor of textured harmonies that added yet another layer to the design, serving as something more than simple background noise. Neither was the band content to settle for clichéd lyrical content, vying instead for something more visual and poetic. But while the band may have been great at rocking the hell out of a club, they weren’t so good at keeping track of their guitar technician. At least not during one Ohio outing where the tech went MIA. They finally found the guy passed out in an adult movie theater at three o’clock in the morning. Luckily, the band possessed a great sense of humor, as evidenced by Mike’s endless litany of prank phone calls and their habit of playing dodge ball in the dark in their rehearsal room. Apparently nothing gets the creative juices flowing like an unexpected ball smacking you dead in the kisser. But despite hitting the road and paying their dues, despite having a unique sound and a fresh style, the band just never managed to catch a break. 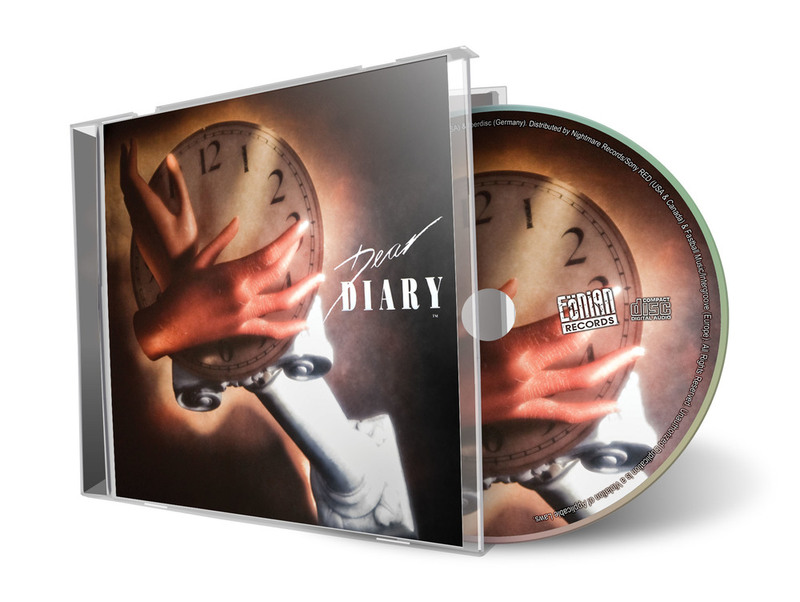 They had arrived just a little too late for the commercial metal party and like so many other bands with similar stories, grunge came along and stomped its down-tuned foot all over DEAR DIARY’s style of rock. Sometime in the early 90s, the band played their final show at the Thirsty Whale in River Grove, Illinois. As the final power chord reverberated through the club, the book officially closed on DEAR DIARY. Regardless of how the past turned out or what the future holds, these guys can take pride in knowing that they weren’t afraid to pursue their dreams, and while they may not have kept an actual diary, the memories of their rock ‘n’ roll quest are forever tattooed on their hearts and souls.